On Saturday when the Chinese commemorate the first anniversary of the Beijing Olympics, there would be plenty of rhetoric about legacies of the historic event. The politically-minded might lament China's failure to live up to some of their expectations. China remains more like what it has been than what they had wished it would become. Those preoccupied with environment and sustainable development, too, might complain about setbacks. Authorities no longer appear anxious to do whatever it takes for ensuring high environmental standards. And, we are almost sure to hear the same old line that the world should not have awarded the Games to the capital of this country. Unless one had looked at the Games as a potential turning point in the history of contemporary China, which it never was, the legacies are rich and of far-reaching significance, for both China and the world. No matter how eagerly some interested outsiders had wished that the historic occasion would help to maneuver fundamental changes to their own tastes, the Chinese embraced it as a new starting point. In that sense, the Beijing Games did a great job. For the average Beijinger, the finest elements of the Games' lasting legacy include better air quality and more convenient public transport. Indeed, the municipal authorities are no longer nervously counting "blue-sky" days and worrying over foul air. But that is because, on the one hand, air quality in the city has improved, and, on the other hand, some of the expedient measures adopted specifically for the Games are now part of the city's everyday practices. Many had suspected that the Chinese government would reduce the degree of latitude allowed to overseas journalists in conducting interviews. That did not happen. Instead, overseas reporters swarming to Urumqi in the wake of the July 5 rioting were actually surprised at the unrestricted access they had. Seen in the narrow context of information control, this may be something "revolutionary." Yet given the country's determination to press ahead with reforms and opening up, that is also a step it will have to take, sooner or later. The Beijing Olympics served as a catalyst for many positive changes in this country. Higher air quality and more convenient public transport are only some of the most evident. The world and China have never been so close together prior to the Beijing Games. Of course such face-to-face encounter is important for mutual understanding. Outsiders portrayed the Games as China's "coming-out party." 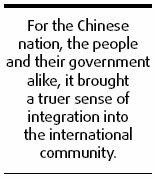 For the Chinese nation, the people and their government alike, it brought a truer sense of integration into the international community. Should not the world celebrate seeing a more confident, accommodating, and responsibility-conscious China? It is the best part of the legacy of the Beijing Olympics.